[ Nathaniel Pigot [ Nathaniel Pigott ], Roman Catholic lawyer. ] Opinion of 'Nath: Pigot', signed and in his autograph, regarding 'The Case of Mr. Thomas Hunsdon' over a Holborn property, with reference to Thomas Green and the Duke of Montagu. 'Middle Temple 9: Novr. 1731'. For information on Nathaniel Pigott (so spelt), see his entry in the Oxford DNB. Pigott was a friend and adviser of Alexander Pope, who composed the inscription on his memorial tablet. 3pp., folio. Bifolium, on watermarked laid paper, folded into the customary packet, with 'Mr. Hunsdon's Case' written lengthwise on the blank reverse of the second leaf. Sixty-lines of neatly and closely written text. The first page is headed 'The Case of Mr. Thomas Hunsdon', and the first part of the document sets this out, in sections dated 23 June 1716, 14 February 1717, 31 October 1719, July 1723, and 1727. [ Sir Travers Twiss, jurist. ] Autograph Letter Signed ('Travers Twiss') to C. S. A. Abbott [ the future Lord Tenterden ] regarding 'the United States Courts having limited the criminal consequences of violating neutrality to the Cruise'. Temple [ London ]. 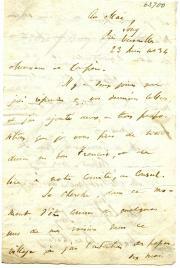 21 May 1867. 2pp., 12mo. With mourning border. In good condition, lightly aged. When Twiss 'suggested the circumstance', Sir R. Palmer 'had some doubts about the United States Courts having limited the criminal consequences of violating neutrality to the cruise [last word underlined]'. There was also 'some doubt about the effect of a sale by a <?> of a Prize Court to a third party. Twiss thinks 'it might be desirable to print & circulate the enclosed observations bearing upon those two points'. On letterhead of Winchelsea, Rye, Sussex. 20 September 1894. 1p., 8vo. In good condition, lightly aged. He is enclosing a contract, and asks to be sent a copy of 'some work on the antiquities of the Exchequer by Mr Hall'. [Sir John Skelton] Autograph Note Signed "John Skelton", Scottish lawyer, to "Mr Brown" [full name given but illegible to me - "Camer"?]. John Skelton (1831–1897), Scottish lawyer, author and administrator. The Hermitage of Braid, 9 May 1887. One page, 12mo, bifolium, fold marks, small closed tear on a fold mark, grubby and marked but text clear and complete. "Can you count upon me for being at dinner on Wednesday & Thursday. If so, I will try to get a friend or two to meet you." [Francis Jeffrey, Lord Jeffrey.] Autograph Letter Signed ('F. Jeffrey') to his nephew by marriage John Hunter, describing his anxiety on losing Hunter as his 'agent and adviser', on his appointment as Auditor of the Court of Sessions. 4pp., 12mo. Bifolium. In fair condition, on aged paper, with closed tears unobtrusively repaired with archival tape. Addressed to 'John Hunter Esqre | Auditor of Court of Sn.' Written three months before Jeffrey's death, the letter begins: 'My dear Hunter - I hope you do not think that I have been forgetful of you - or indifferent to your fortunes - or ungrateful for your very kind expressions - and I firmly believe feelings - towards me - because I may appear to have been slow in offering you my congratulations on your late appointment [as Auditor of the Court of Sessions]'. [Philip Lutley Sclater, Secretary of the Zoological Society of London.] Autograph Letter in the third person to 'Mis Kerr'. On letterhead of the Zoological Society of London, 11 Hanover Square. 29 August 1877. 1p, 12mo. In good condition, on lightly-aged paper, with traces of glue from mount on the blank reverse. Reads: 'The Secretary presents his compliments to Miss Kerr and begs leave to inform her the Composition fee of £35 has been duly paid to Drummond & Co'. [Sir John Fischer Williams, international lawyer.] Typed Letter Signed ('John Fischer Williams') to R. F. Harrod, Hon. Sec., Oxford University Liberal Association, expounding at length on Professor Gilbert Murray and proportional representation. British Delegation, Reparation Commission, 7 Rue de Tilsitt, Paris XVII. 19 March 1929. 2pp., foolscap 8vo. On two leaves, with the second attached at the head of the blank reverse to a piece of grey card. In fair condition, on aged paper. He writes that he will be 'very glad to sign the memorandum enclosed with your letter of the 14th instant in support of Professor Gilbert Murray'. He proceeds to remark at length on a 'statement in the last paragraph of the memorandum as to the working of Proportional Representation'. [Samuel Warren, lawyer, writer and Bencher of the Inner Temple.] Autograph Note Signed ('Samuel Warren | Bencher') 'To the Verger of the New Temple', authorising admittance to the Temple Church. [The Inner Temple, London.] 7 November 1852. [John Bell of Lincoln's Inn.] Part of document giving his legal opinion in a cause, written out by a clerk, and signed and dated by him. Lincoln's Inn. 14 March 1828. Bell's entry in the Oxford DNB records that 'In conversation with the prince regent (later George IV), Lord Chancellor Eldon was said to have described Bell as the best lawyer then at the equity bar, though he could "neither read, write, walk, nor talk": Bell was lame, spoke with a broad Westmorland accent, the effect of which was heightened by a confirmed stammer, and wrote in a hand never more than barely legible. [Sir Francis George Newbolt, lawyer and lecturer.] Autograph Letter Signed ('Frank Newbolt.') to Lady Holroyd, concerning a present for 'Michael', and an 'excellent drawing of my "honest phiz"'. 26 Kensington Park Gardens, W. [London]; on cancelled letterhead of Oakley Lodge, Weybridge. No date. 3pp., 16mo. Bifolium. Good, on lightly-aged paper. He is posting a watch, which he describes as his 'small offering to Michael'. 'Please tell your husband that my wife is honestly much pleased with the excellent drawing of my "honest phiz", as Calverley calls it, though from her intimate knowledge of the original she thinks certain points open to criticism.' He continues in the same vein on the same topic for a page. Autograph Letter Signed ('Edw. Foss') from Edward Foss, author of 'The Judges of England', regarding the prosecutor of King Charles I, John Cook [Cooke], Solicitor-General of the Commonwealth. With page of extracts on Cook by the recipient. Churchill House, Dover [Kent]. 15 December 1863. 3pp., 12mo. Bifolium, with Foss's letter (33 lines) on both sides of the first leaf, and the page of extracts by the recipient (38 lines) on the recto of the second leaf. Good, on lightly-aged paper, with one corner of the first leaf cut away. The letter is addressed to 'My dear Sir', without any indication of the recipient's identity. Corrected Autograph Drafts of three works by Dr William MacOubrey, consisting of two poems ('To arms! Patriot gallant band' and 'Away! Away nor strive') and a paper on the Ancient Britons, the Romans and Geoffrey of Monmouth, titled 'Brutus'. None of the three items with place or date (1850s?). None of the three items appears to have been published. They are in fair condition, on lightly-aged and worn paper. First poem: Headed 'By Dr. MacOubrey' and signed 'Wm MacOubrey' at foot. 1p., 12mo. Five four-line stanzas, and a four-line chorus, with a couple of minor corrections. The first stanza reads: 'Away! Away nor strive | To tempt me from the bowl | Away! and let me live | This night without control'. This followed by the chorus: 'Then quaff the Wine, | Spirits of Joy | Oh! Sense Divine! | Without Alloy!' Second Poem: Untitled. 2pp., 12mo. Autograph Manuscript Signed ('Montague Smith') by Edward Montague Smith [later Sir Edward Montague Smith], Member of Parliament for Truro, giving his legal opinion on a property dispute for Thomas B. Knight of Lime Street, London, and Cox of Honiton. Temple [Inns of Court, London]. 9 December 1862. 1p., 4to (31 x 32 cm). 26 lines, signed at end 'Montague Smith | Temple | 9 Dec 1862'. In fair condition, on lighly-aged paper, with minor damp damage to one edge. Docketed on reverse '1862 | Case for the Opinion of Mr. Montague Smith', with 'Took 3 Gu[ine]as' (Smith's fee) and initials in another hand. At foot, in a third hand: 'Thomas B. Knight | 34 Lime Street | City. E.6. ', and beneath this, in a fourth 'Cox | Honiton'. Typescript of report of speech by Lord Chorley [Robert Samuel Theodore Chorley, 1st Baron Chorley], titled 'The Role of National Service in the Modern State'. 5pp., foolscap 8vo, each on a separate leaf. Fair, on aged paper, stapled together in one corner, but with the last leaf detached. The subject is not compulsory military service but the role of the civil servant (see the conclusion, quoted below). The first paragraph reads: 'Lord Chorley said that there is a close connection between the sort of function which the machinery of government performs in any society and the civil service which is required in that society. Copy of typed notes by the British jurist and Labour politician Lord Chorley [Robert Samuel Theodore Chorley, 1st Baron Chorley] for a talk by him as part of a discussion on the role of the British civil service. 11pp., 4to. In fair condition, on aged paper, with a couple of manuscript emendations. Without title, date or author's name. Can be dated to 1952 from comment on p.9: 'Power of Service enormously greater in 1952 than in 1852 - both individually and collectively.' Chorley's authorship is clear from the context: on the second page he recalls that he was 'a temporary Civil Servant in the first world war', and the document concludes: 'Suspect chosen because identified with Chorley Report - no responsibility beyond that of other members of the Committee. Autograph Letter Signed ('S. Bannister'), in French, to 'Monsieur de Monglave, l'Institut Historique'. Au Mai, Jouy, Près Versailles, 23 Juin 1834'. 12mo, 4 pp. Bifolium. Good, on lightly aged paper. Addressed to 'Monsieur et Confrère'. 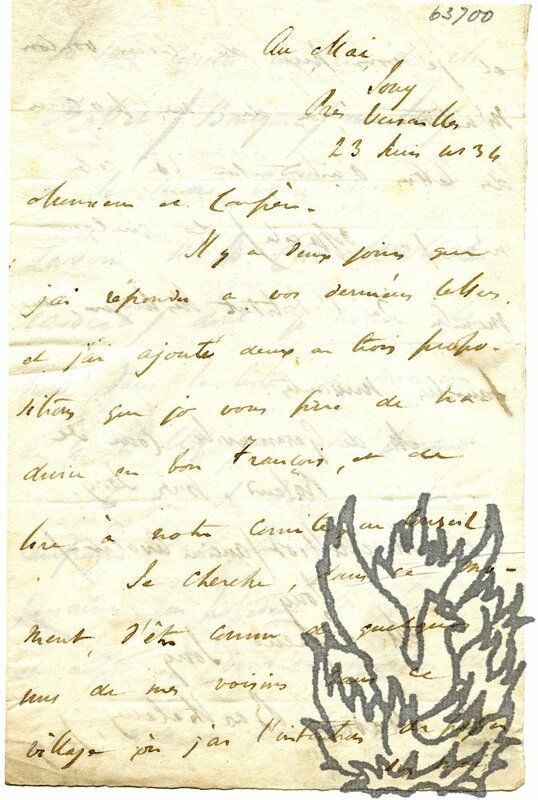 He replied to de Monglave's last letters a couple of days previously, and he has addded 'deux ou trois propositions que je vous de traduire en bon François, et de lire à notre comité, au Conseil'. He wants to get to know 'quelques uns de mes voisins dans ce village où j'ai l'intention de passer six mois', and asks for letters of introduction. Lists four families he wishes to get to know and names some individuals with whom he is a little acquainted. Printed card, 10 x 6cm, printed "Louis Renault . Membre de l'Institut / Professeur de la Faculté de Droit" with address as above. He has added in purple ink, autograph, "Ses sincères sentiments et compliments". Autograph Note Signed to unnamed correspondent. L[aw]. C[ourts]. 13 Ap. 1839'. Autograph Note Signed to an unnamed correspondent. Lawyer (1841-1931). One page, 8vo, good, anticipating exclusion from the House of Commons, but determined to serve his country nevertheless. 12 June 1902, Hornton Lodge, Kennington, with embossment of the Royal Courts of Justice. Lord Chief Justice of England (1842-1915). One page, 12mo. Marked "Confidential". "My sister told me of the letter. I have made some enquiries about the man who wrote to you and from what I hear I certainly think you ought not to engage him. You will of course treat this letter as strictly confidential." 17 January , no place. Judge (1819-75). One page, 12mo. "Jany 17. / My dear Hollams / I have with some hesitation accepted the Common Pleas." Honyman became a judge in the Court of Common Pleas on 23 January 1873. Dreadful sprawling handwriting. Paper worn, torn, grubby and creased, with blank second leaf repaired and with four pieces of gummed tape adhering to it from previous mounting. Judge (1734-99). One page, 12mo. "<...> George Murley / Sarah Martin / Given under my Hand the 10th. day of August 1780 pursuant to the Statute in that case made and provided. / [signed] James Eyre". Paper slightly discoloured. 29 March 1884, with letterhead 79 St George's Square. Lawyer and politician (1835-1916). "Dear Sir / I have so many calls on my resources & already subscribe to so many Cricket Clubs in Chatham that I fear I shall not be able to comply with your request - / Yrs very faithfully / J. E. Gorst". With traces of previous mounting to the reverse of the blank second leaf. 25 October 1906, Great Hormead, Bartingford, Herts, on deleted letterhead of the South African Hospitals Commission. English judge (1840-1918). 3 pp, 12mo. "[...] Amongst all the letters received by me on my retirement, none gave me greater pleasure than yours. You & I have known each other now for many years, & I have to thank you for the great kindness you have shown me throughout. I hope I may say that there has always been between us a true friendship, & I trust that it will not cease or diminish because I am no longer an active practising lawyer [...]". Signed "Robert Romer". With four gummed pieces of paper from mounting adhering to the blank verso of the second leaf. Judge (1801-83), Baron of the Exchequer. One page, 12mo. "What is the true state of things at Belfast / Sam Martin". Martin was born in County Londonderry. Four pieces of gummed paper adhering from mounting adhering to the otherwise blank verso. Judge (1725-1807). "<...> John Jaggers / John Holmes / James Graham / John Watkins / Given under my hand this 20th. day of March 1784 pursuant to the Statute in that Case made and provided. / [signed] W H Ashhurst". The DNB gives both spellings of the surname. Paper slightly discoloured.